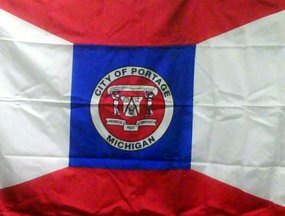 The flag of the City of Portage, Michigan, is divided in 5 fields. In the center is a blue square with the city seal in it. From the angles of the square four diagonal lines are dividing the rest of the flag in four fields. Above and below red, and left and right white. Photo of the flag thanks to Devin Mackinder, CIO/IT Director. "Portage is a city in Kalamazoo County in the U.S. state of Michigan. The population was 44,897 at the 2000 census. Portage is adjacent to the southern boundary of the City of Kalamazoo. The city was incorporated from the entirety of the former Portage Township on December 31, 1963." - from Wikipedia: en.wikipedia.org/wiki/Portage,_Michigan.